Here is the first of (long) series of simple recipes that I hope will stimulate into you creating more recipes! 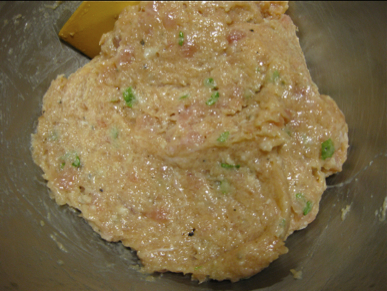 -Cut chicken and leek into rough pieces and drop them into a food processor. Add one half of the cornstarch, water, soy sauce, sake and mirin each. -Process well until you obtain a smooth paste. Stop the food processor from time to time to move chicken from the centre with a spatula. -Pour the rest of the soy sauce, sake, mirin, ginger juice, and cornstarch dissolved in water over the tsukune and cook until the sauce has caramelized. By dividing the seasoning in two halves, the chicken will be thoroughly impregnated with the taste. make sure you cook over a low fire all the time! Here is the second of (long) series of simple recipes that I hope will stimulate into you creating more recipes! -Chop the leaves fine as shown on above picture. -In a large bowl, drop in the minced chicken, salt, pepper and black sesame seeds. Mix well until it becomes a smooth paste. -Add egg yolk, Japanese Sake, Cornstarch and grated ginger. -Add chopped shiso (leaves) and mix well. 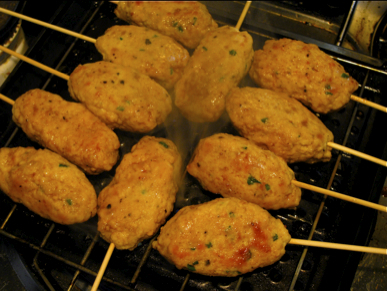 -make tsukune/patties in size of your liking around a wooden stick. 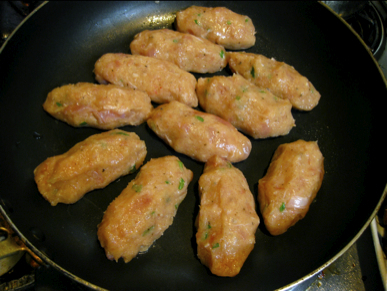 -Pour a little oil in a non-stick frypan and place tsukune as shown on picture. -When one side has reached the right colour, turn over and fry until both sides have reached the proper colour. You may add a little more Japanese sake for seasoning. -Cover with large piece of foil paper and stema/fry on a small fire for a while. -That’s how the should look when ready! -Serve a little lemon juice and lime and peppr paste, and plenty of beer! Naturally, youi may use a sauce of your choice as well, or ponzu, or soy sauce, etc. Here is the third of (long) series of simple recipes that I hope will stimulate into you creating more recipes! The difference is that this time it is made with tofu as well! -In a bowl mix tofu, chicken, onion, ginger, egg, pepper and cornstarch. Make patties/tsukune. -Pour some oil in a frypan. On medium high fire fry both sides of tsukune until they have reached a nice colour. Add some water. Cover with lid and steam/cook on low fire. -Mix soy sauce, Japanese sake and sugar in a bowl. -Take off lid from tsukune. Turn to medium fire. Pour in the sauce and simmer until ready for serving. Great served wrapped in shiso leaves! Here is the fourth of (long) series of simple recipes that I hope will stimulate into you creating more recipes! -Chop leek finely. Grate the ginger. Grate the yama imo. 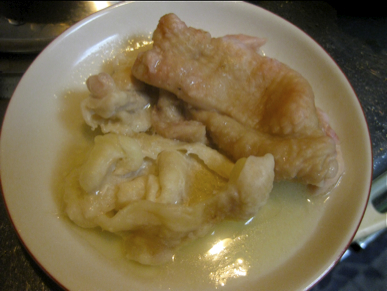 -In a large bowl drop the the minced chicken, soy sauce, salt & pepper, seame oil and mix quickly by hand. -Add leek, ginger, yama imo and the cornstarch. Mix well. Let the mixture rest in the fridge for 30 minutes. -During that time prepare the kaiwaredaikon, freshly grated daikon and sesame sesame seeds. -Fry the tsukune/patties after having shaped them into 3 or 4 equal sized circles with salad oil on both sides over a medium fire until they are a light brown. -Add 2 tablespoons of water, cover with lid and steam/simmer for a while. 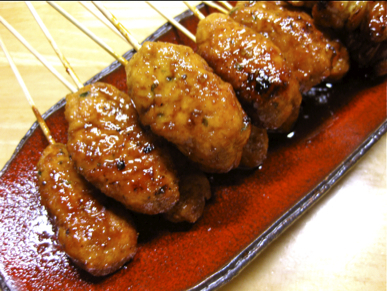 Check if tsukune are well cooked with a thin wooden stick. -Add the tare/sauce ingredients and cook until the tare has “caramelized”. Serve on a plate with kaiware daikon, grated fresh daikon and white seasme seeds for the final touch. Do not fry tsukune over a strong fire or they will get hard. -Chop the thin leeks coarsely. In a bowl mix minced pork, Japanese sake, soy sauce and grated ginger until smooth. -Add grated Chinese yam and mix until smooth. It will take some time as the yam will tend to separate at first. Add cornstarch and mix until smooth. -Add chopped leeks and mix well. -Heat a frypan. Pour in a little oil. Make 6~7 round patties/tsukune by hand or with a mold. Fry both sides on a medium fire. -When “eyes” have appeared on both sides, reduce fire to small. Add sake, cover with glass lid and steam fry. -When you are sure that the tsukune are well cooked, add soy sauce, mirin and sugar and let simmer until sauce has “caramelized” the tsukune. -You can increase the amount of leeks and gingeraccording to your taste. -You may replace leeks with parsley. -Any soy sauce is fine, although a sweet variety is recommended. Otherwise you may increase the amount of mirin. This is a new recipe for Tsukune, the 6th one! -In a small pan, pour the japanese sake, Japanese sweet sake/mirin, and white wine. Cook on a low fire to allow the alcohol disappear. -Add the soy sauce, thick soy sauce, brown sugar, black pepper and garlic. -Cook over a strong fire. As soon as bubbles appear, switch off fire. -Take the skin off all chicken. Cut into small enough pieces and heat in microwave for 1 minute. 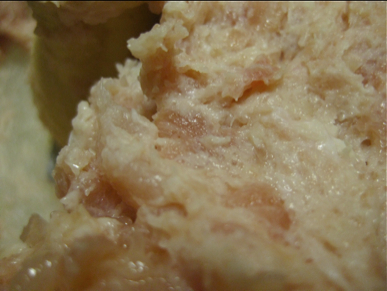 This will enable you to process it as a food processor cannot work with raw chicken skin. The skin has to go into the recipe for greater taste! 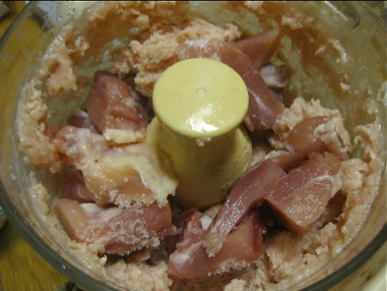 -Frirst drop the skins into the food processor and turn until skin has been cut into fine pieces. -Drop in the breast meat cut into pieces and turn until the meat turns white. -Finally drop in the leg meat cut into pieces and turn. -This is how it should look once processed. -Transfer the whole minced chicken into a bowl. -Add the salt, sugar, soy sauce, black pepper, egg, shiso leaves, sesame oil and mix well. Taht is how it should look before you shape the tsukune! -As the tsukune/patties will be toosoft to skewer, first fry them in a non-stick pan to ensure their outside is solid enough before you pass skewers through them! -Grill them over a low fire. Dip (or baste with) the tuskune in sauce/tare at least three times halfway. Everytime turn them over as one side has become dry. I like them served with a fresh egg yolk for further seasoning! Hey thanks for these recipes…just returned from two weeks in Tokyo and Kyoto, and I am obsessed with all things Yakitori! These all sound so delicious. I was looking around for the kind of tsukune they serve at Tsubohachi izakayas in Japan, and was pleased to see so many more variations! Looking forward to provide more information someday! My dear Friend, I’m so glad to please you! If you have any suggetsons, I7ll be glad to write from them!